Last week, LPF returned a loggerhead sea turtle (Caretta caretta), which had been rescued past January with serious injuries to the neck and the right flipper due to fishing gear. After being retrieved in Gran Canaria and nearly for over 6 months, the turtle had been recovering in Loro Parque’s aquarium. 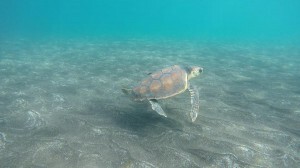 The state of the turtle could have been much worse, since these human activity related accidents can derive into amputations and deaths by suffocation in many marine animals before being rescued. 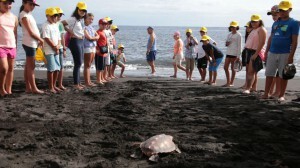 Given the good maritime conditions, the release took place at Punta Brava beach in Puerto de la Cruz. Thanks to the careful care taken by the aquarium, the turtle gained a kilo and improved its swimming skills. As a result of this, it was able to return with all normality to its natural envi-ronment. 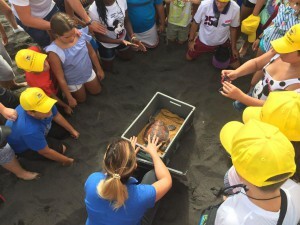 Taking advantage of the occasion, we invited 40 students from Gran Tarajal School in Fuerte-ventura, who were on the island with the “Descubre” project of Educon, to whom we presented an awareness talk about the conservation of sea turtles and the importance of taking care of our ocean.